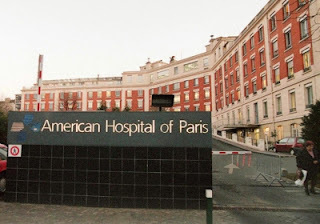 A less than weary for ware Pierre Lavoie sat sitting up in his room at The American Hospital in Paris. “I’m quite all right. I’m quite all right. Stop fussing,” he said to the attending nurse, ushering her away with his bandaged hands. “How is the patient?” inquired Diana, popping her head around the door. “Well, you're still the same flatterer I met this morning,” laughed Diana. “It’s enough,” Diana crisply replied, standing up. “Oh, I’ve brought you these grapes, but you may have to get one of those patient nurses to feed you, without use of your hands. There are guards on the door,” she said on her departure. A call Diana had been expecting came through just after she had got changed in her hotel room. Wearing a simple black buttoned shirt and light grey jeans, she threaded a chunky silver studded belt around her waist, while answering her cell phone. “Hi, Diana, I’ve just read your latest update. Lavoie attacked by vultures? Boris Sidrov now a possible Nazi? You’ve had one hell of a day, babe...” said Christopher Dalton. “And I hear it isn’t over yet for either of us,” responded Diana. “I guess they’re using the large number of tourists as human shields? “No, Diana, it’s too risky. I can’t authorise it. Besides I need you,” Dalton insisted. “You know you can handle it, Chris, and I don’t need your authorisation,” Diana asserted. Out of the near wood, a figure emerged at the St Petersburg’s Civic Circus’ perimeter. Wonder Woman could easily have leapt right over the 10 foot high security fence, but for all the powers she possessed, an inconspicuous presence wasn’t one of them, therefore, it was Diana Prince, using a wire cutter, who made her entry into the Circus’ grounds. Diana slipped the cutter back into a secret pocket in her belt, as she made her way between trailers. There was little activity in the darkness, except for some distant voices resonating from the big top. It looked like Diana’s wager of skeleton staff during the hostage exchange had been a good one. One cabin door sign read: “Store Room, No Entry.” It had a keypad lock. From her utility belt, Diana pulled out a pen-like torch with an ultraviolet beam, which showed, in bright green, fingerprints on the buttons. The four most used digits were apparent. As with most keypad locks, the order of the digits were not required, or Diana got lucky, when she pushed the door open. At first the inside appeared of little interest; an empty desk with wood chippings on the floor. However, the next room had a familiar calling. There were no windows, so Diana switched on the lights, to see 50 to 60 Andean condors squawking at her from behind bars. The sound of the birds raised the alarm of their keeper. Diana heard somebody activating the keypad combination. She got ready to assault whoever came through the door. Diana wasn’t expecting such frailty; an old decrepit looking man shuffled into the caged room. Wearing a long black cloak with a crinkled bowler hat, the man stared furiously at the intruder. “Who are you and what are you doing here?” he demanded. Diana shut her eyes in mock disgust, “I just walked in,” she answered on leaving the cabin. Waiting outside was a bespectacled man with a hand gun. “In, in,” instructed Adamski at the entrance to the big top. He never followed. High above, two women in matching white and cyan leotards emerged from a hatch. On the high ropes they swung and looped the loop, before abseiling onto the sandpit beneath them. They flexed their pronounced biceps and triceps, while they danced menacingly towards their target. “You know, I think I’ve seen you girls on TV,” informed Diana, “Weren’t you both disqualified from gymnastics for using steroids? Looks like you still haven’t kicked the habit,” she mocked. The two former gymnasts halted their approach and looked at one another. The two assassins cartwheeled towards their target. Diana easily evaded Arina’s attack and narrowly escaped Anya’s cartwheel. The sisters stood either side of Diana. Arina aggressively postured towards her, allowing Anya to sneak her arm around her opponent’s smooth neck. Diana responded with an elbow to Anya’s abdomen, then throwing her, hard, over the near hoardings. The Russian lay outside the ring, moaning in agony. But at the same time her sister rushed Diana to the ground. The two women scrambled over one another in the sand. They panted for control, however, Arina’s extra aggression helped her to get on top of Diana. Their hands were locked against one another as Arina, slowly but surely, forced Diana’s hands into the sand. Pinning her opponent in position for a few seconds, the Russian took time to remark on the circumstances. “Ha, you not so strong,” she teased, hovering over her grimacing rival. The comment was enough to mobilise Diana into making every effort to heave her antagonist off her. So Diana’s free right thigh shot into the Russian’s hip, tumbling Arina on to her back. But Diana couldn’t capitalise on the turn of events, as Anya was making her way back into the ring. When Diana rose to meet her, the acrobat performed a roundhouse kick to her face, which the IADC agent swiftly evaded. In response, Diana hand chopped the aggressor’s neck; she fell like stone. With Arina posturing again, and Anya willing herself back on to her feet, Diana knew she needed to find a way out of the situation. She made a break for the stands, jumping up the stairs. Unfortunately, the exit doors were locked, so she took cover behind a row of seats. Fortunately, she found a lying broom on the floor among used cans and wrappers. The two sisters made their way up the stairs, cautiously, scanning for where Diana might be hiding. When Arina approached the exit level, a broom sped across her knees, tripping her forward into the doors. As Anya came to her sister’s aid, Diana stood up and plunged the broom handle into the Russian’s mons pubis. The acrobat ricocheted, uncontrollably, down the stairs. Diana thought the message was meant for Arina who attempted to bear hug her from behind. In the struggle that ensued, Diana found herself forced down over the top of a seat and wasn’t able to notice Adamski creeping up the stand. Arina aggressively shook the broom out of her enemy’s hands. She then pulled Diana’s arms behind her back, into a semi-lock, while pressing her opponent’s face into the cushion of the seat, angling her lower body across Diana's lumbar region. It was all too easy for Adamski to calmly take out a bottle of clear liquid, soak a cloth and apply it to his victim. As soon as the wet fabric hit her mouth, Diana’s piercing blue eyes retreated upwards, as she inhaled the sickly sweet scent of chloroform. Her intensity of resistance dropped to a level that Arina could manage easily. They now sat Diana up on the seat behind. One further application of the potent compound caused the heroine to slump into unconsciousness. Small mistake you used immobilize and you should have used mobilize. Thanks, Tom, I've corrected it. Shame on Diana for forgetting the Adamski. :) Good action.